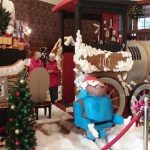 Royal Park Hotel Gingerbread Train 2018 – pics, video, and info for 2018 holiday season. 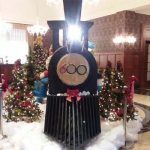 The giant gingerbread display returns to the lobby of the Royal Park Hotel in Downtown Rochester for the 2018 Christmas and holiday season with a toy train theme – the Gingerbread Express. 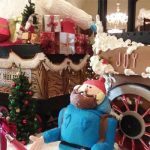 This is the TENTH ANNIVERSARY of gingerbread fun at the Royal Park Hotel! This year’s creating features characters from the TV Classic, Rudolph the Red-Nosed Reindeer. 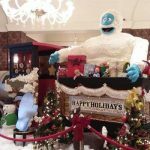 Come out and see Gingerbread Bumble, Hermie, Yukon Cornelius & more. 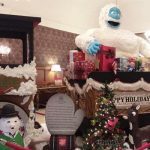 The gingerbread creation has evolved throughout the years, from its small beginnings as a gingerbread house that was transformed into a gingerbread lighthouse, to most recently a gingerbread train. 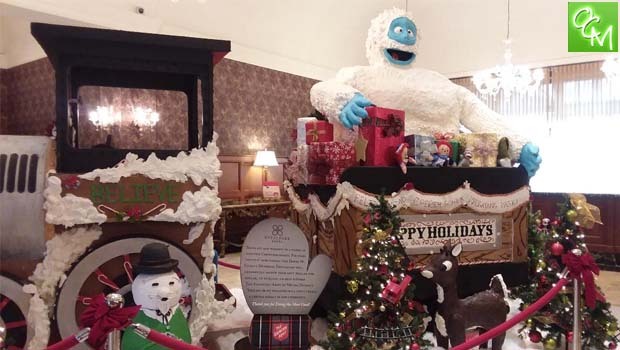 New this year, the amazing Royal Park Hotel pastry team re-purposed the gingerbread house frame into a holiday Salvation Army store front which will be adjacent to the train. The Gingerbread Express is surrounded by Christmas decorations and is loaded with a bag filled with toys Santa needs to deliver. 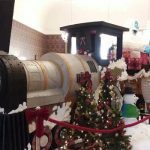 The giant gingerbread toy train is made up of all edible pieces that are constructed to look like a functional train! Gingerbread planks, candy bolts, fondant siding, and more! The “mitten” tree will return, with a paper mitten ornament hung for every $10 or $25 donation. To help kick-start the donations, the David W. Elliott Memorial Foundation will generously contribute $5,000 to support The Salvation Army’s efforts to help those in need. Those with a sweet tooth will be truly amazed as the hotel’s restaurant, Park 600, will deck the halls with delicious desserts. 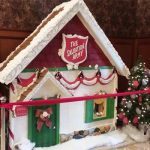 Calories don’t count when it’s for a good cause because $1 from every dessert sold will support The Salvation Army of Metro Detroit’s 2018 Red Kettle Campaign. 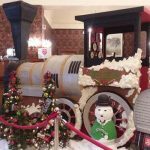 For more info on Royal Park Hotel Gingerbread Train 2018, stop by the Royal Park Hotel today!